There are some cities which are the attraction and some that are merely the base from which to see the attractions. Everything I read about Kota Kinabalu lumped it in the latter category with a shout-out to the food. In many ways, this is true. If you look at Kota Kinabalu with the tourist gaze, there are very few sparkly things to catch your eye. 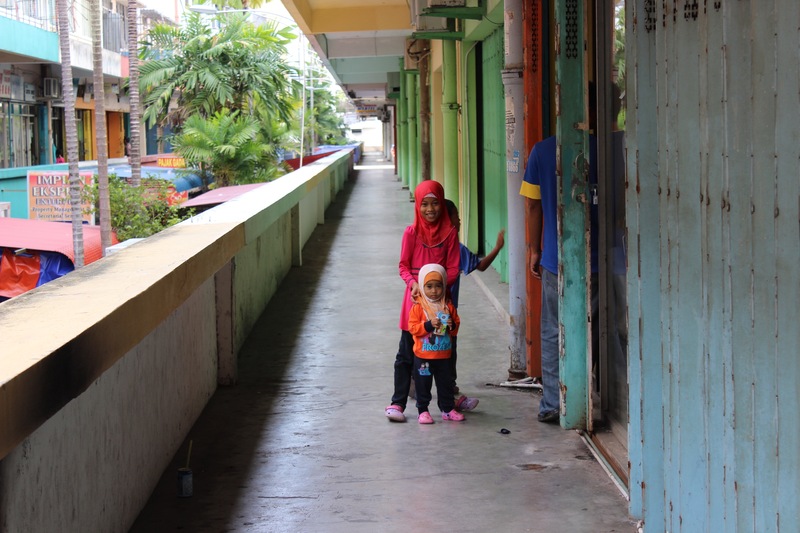 If you look at it, however, as a the hub of Sabah, Malaysian Borneo, where people are living out their daily lives, you’ll still see a small and scruffy city, but one that has an immense vibrancy. I do not exaggerate when I say I could happily spend a few weeks there, despite a city centre so small that it’s walkable in less than 20 minutes. This praise is more than about making my stomach happy with the fantastically cheap and tasty offerings but rather there is something about the atmosphere that is very appealing. I just want to sit in a cafe and hang out. Kota Kinabalu has so much character. Malaysia is just such a fascinating cultural mix and Sabah is no exception. Indigenous people make up the greatest proportion of the population, with the Kadazan Dusun representing the largest group – somewhat unsurprisingly as these were two separate peoples originally. Malays come in third and, like Peninsular Malaysia, there is a large Chinese population. Overall, 28 ethnic groups are officially recognised as indigenous or bumiputra (indigenous Malays) in Sabah. Can you imagine the richness and diversity of culture, customs and cuisine? For me, seeing the cultural and religious mix was a source of fascination when I visited Kuala Lumpur four years ago. Growing up in rural UK, I had barely come across Muslim or Chinese people, let alone side-by-side. Of course, sociocultural integration is not – and has not been – without issues in Malaysia, but the country still represents an impressively multicultural, multi-ethnic and multilingual society. 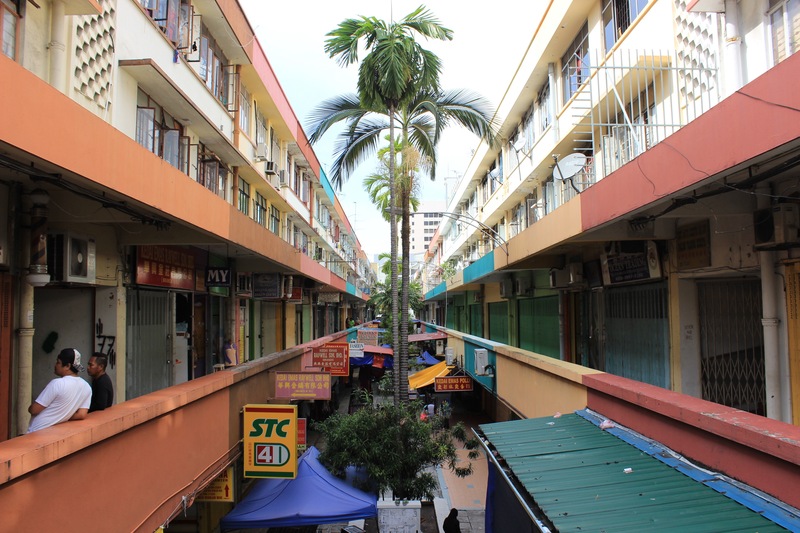 Of course, wandering around Kota Kinabalu, it’s hard to untangle the cultures as many people come from a mixed indigenous background. Furthermore, the city has been spattered with shopping malls and other modern tourist trappings, so you’ll find a KFC on every corner. 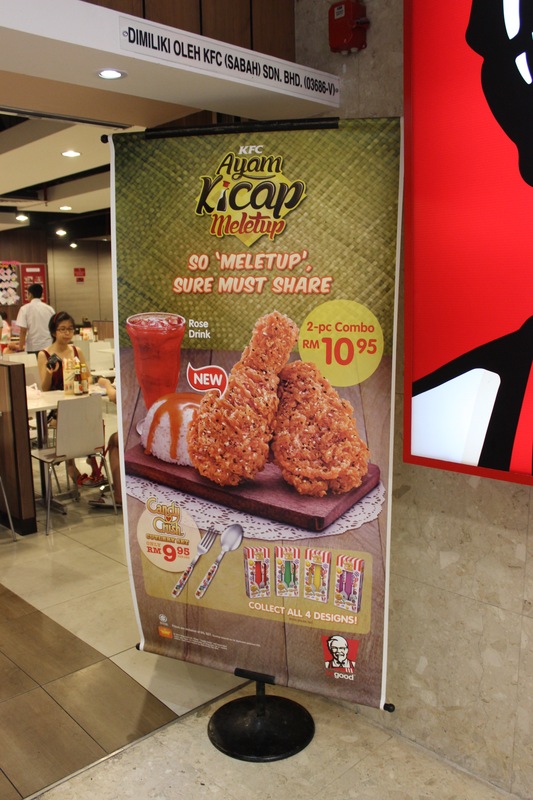 In fact, the Sabah tourist map proudly boasts there are 54 outlets throughout the entire of Sabah, describing KFC as a ‘local favorite’. But there’s a lot to be absorbed – both old and new – and the best way to start is with the food. Just perhaps not KFC. 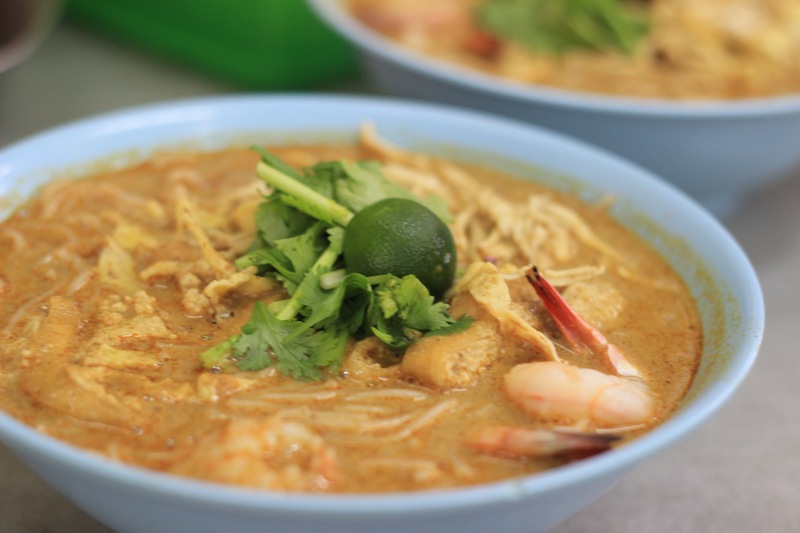 This is a curry noodle soup that has many variations across southeast Asia, but the one found in Sabah relies heavily on coconut milk to form its broth, with chicken, tofu, and prawn comprising the toppings. 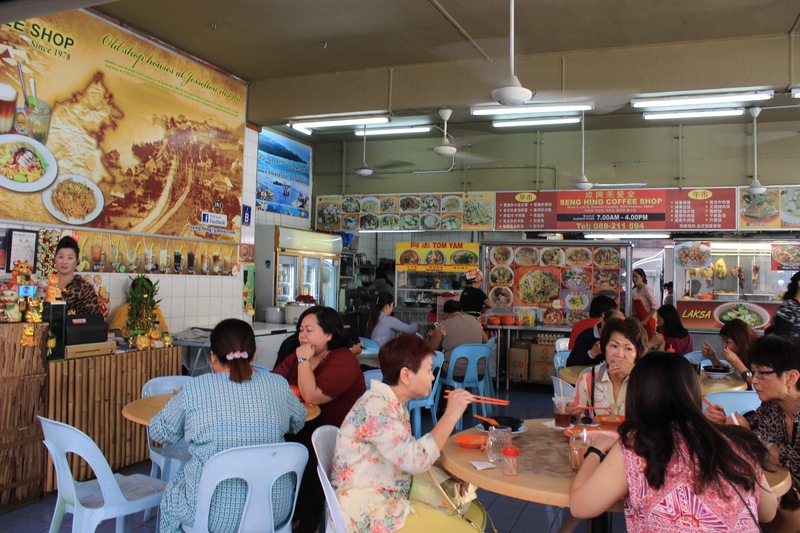 The first laksa we tried was at the perpetually popular Kedai Yobi Yee Fung, just off Kota Kinabalu’s famous Gaya Street, home of the Sunday market. You can’t really miss this place – whatever time of day, it always has customers, which is surely a good sign! 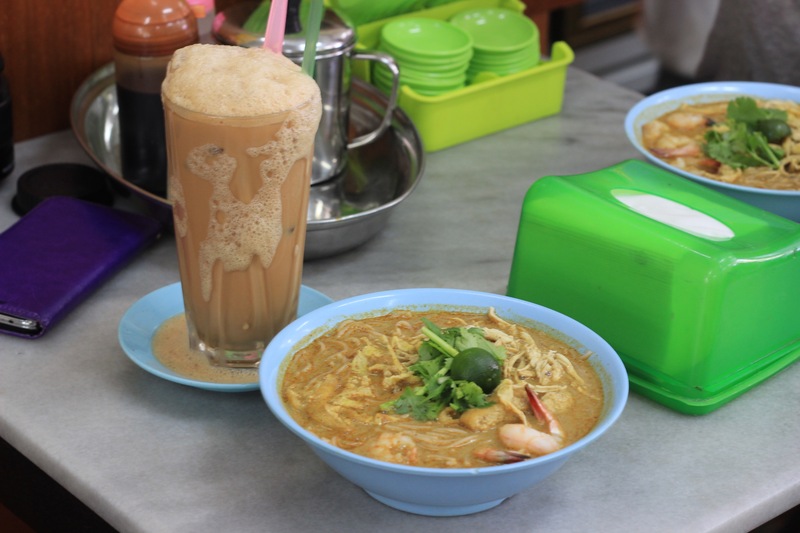 Order the Lee Fung laksa (6RM for a medium, 7RM for large) and a full-to-the-brim bowl, garnished with lime and coriander, will be placed in front of you in two minutes, allowing you to dive straight in. This laksa is quite delicate in its flavour with thin, soft noodles, taking a mild approach to coconut and leaving heat alone. However, delicate does not mean bland and there is a richness to the soup that will leave you licking the bowl clean. Plus, there is chilli on the table – add to your taste! The chicken and prawn are unseasoned, and didn’t seem to be of exceptional quality, so I advise dunking them well and truly in the soup before eating. 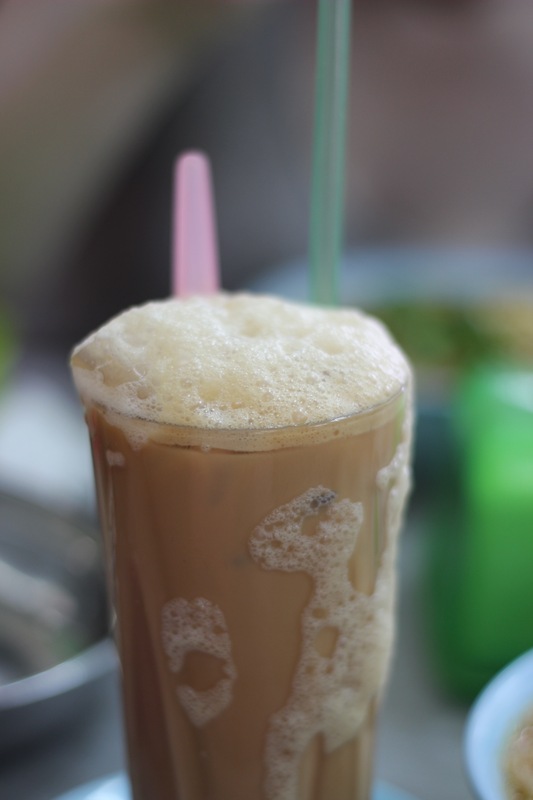 Of course, no meal here is complete without a drink of teh tarik – see below. Tucked in the corner of the fourth floor of the shopping mall Centre Point Sabah, I was truly, truly sceptical when I saw the laksa here was recommended. Yet Kedai Kopi Yee Fung had left us craving more and it was very close to our accommodation so we thought we’d give it a shot. Surprisingly difficult to find in the shopping centre, we finally spotted a neon sign and were presented with a counter service cafeteria-style room that did nothing to increase my confidence. I was so very wrong. This was undoubtedly the most delicious thing I ate in my entire trip. I could eat it every day and never grow bored. 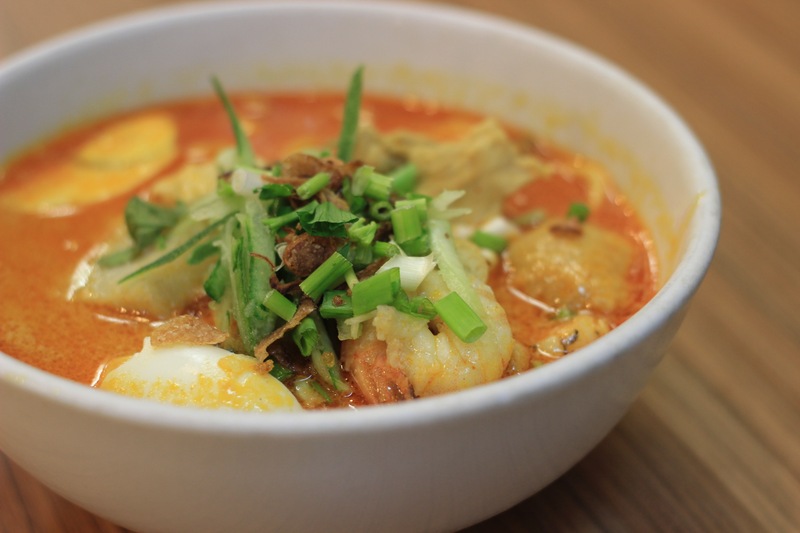 Contrasting quite strongly with our previous laksa, Palm Cafe’s Laksa Melaka goes for thick and heavy and bold. The spice level might be too much for some, but if you enjoy some heat, you’ll be pleased that the chilli never overrides the coconut and other underlying flavours. Of course, there is even more chilli that you can add. And it comes with a hard-boiled egg. I found all the toppings to be tastier than Yee Fung. Teh tarik is the go-to drink in Malaysia. It’s a sweet, frothy milk tea that seems to be served overflowing. It’s brilliant – and even more so if your mouth needs a little cooling after some spice. 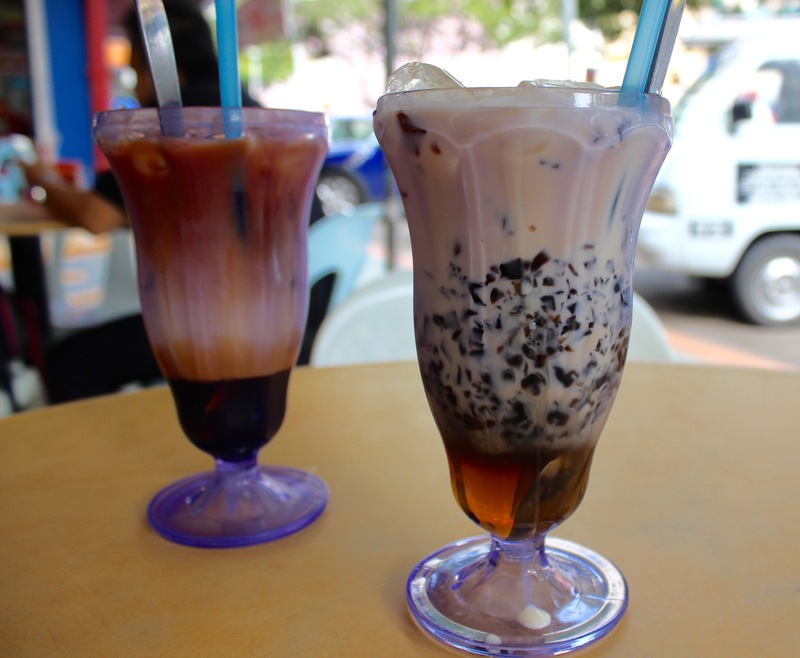 Around Kota Kinabalu, we tried a three-layer tea at Fong Ip (Gaya Street), which had even more depth of tea flavour. Perfect. Subsequently I tried the three-layer coffee, and whilst pleasing, I think the Vietnamese do sweet coffee better, so stick to the tea. This cafe has a great laid-back atmosphere and free Wifi so it can be a good place to sit and recharge before your next adventure! The owner is a friendly guy, so if you see him around, you might enjoy a chat! My friend also enjoyed cincau (grass jelly) in milk, which is commonly found on the menu, and not nearly as sickly as you might imagine. I’m just all about the teh tarik. And these are the words of someone who chooses coffee over tea any day. Not in Malaysia. Noodle-lovers – this is for you! You can only try this dish in Sabah so do not pass up the opportunity. 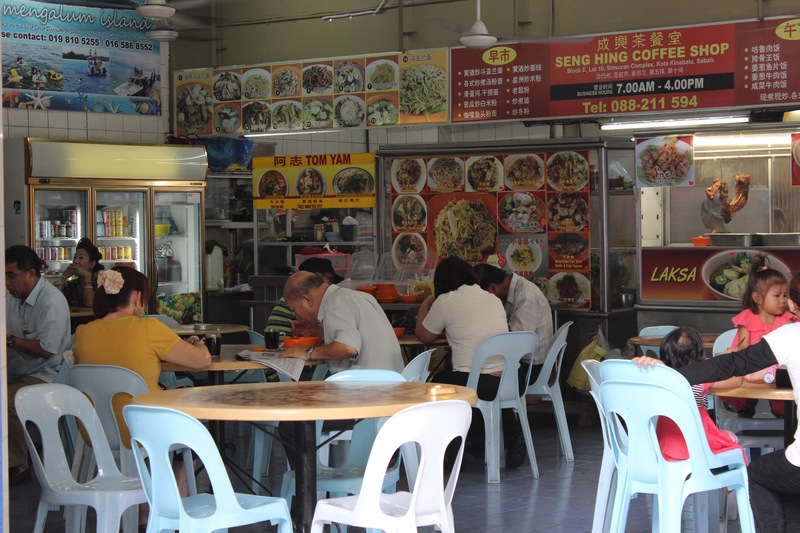 We sampled the noodles at highly-recommended shop Kedai Kopi Seng Hing for breakfast. 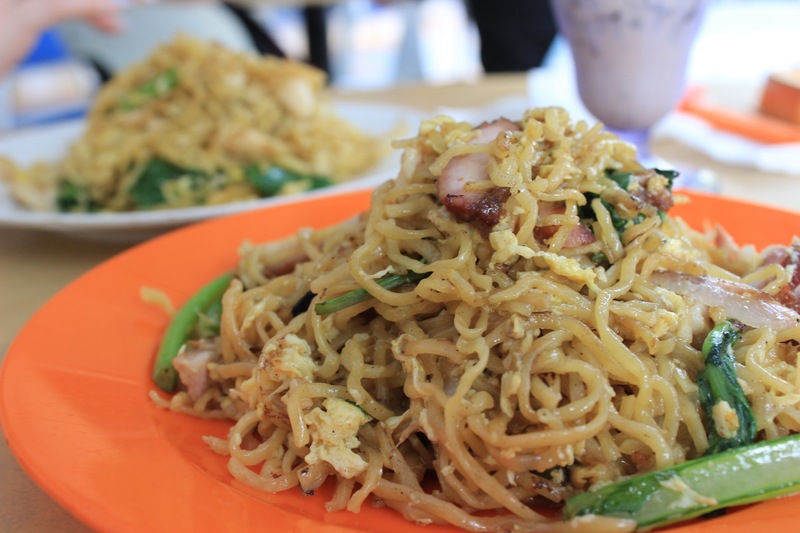 Originating from the town of Tuaran, these are egg noodles, made with just the yolk, that are then fried over a very high heat with egg and green veg (usually pak choi) and a choice of meat – usually char siu, and let’s face it, who is going to turn down char siu? It sounds like the simplest dish in the world but it is simultaneously comforting and moreish, and again, if this were my everyday breakfast, I’d be happy. This had been recommended by one blogger as the local dish to try, as the thing that people really missed when they went abroad. The best way to try is the ‘dry’ version – with the noodles and soup separate. i looked at the pictures of some heavily coated noodles and pale-looking pork floating in a clear but fatty looking soup and thought it really must be in the taste and not in the looks. Sadly, we were a little let down – maybe you really do have to be a local to ‘get it’. We went to Kedai Kopi Melanian (No. 34, Ground Floor, Jalan Pantai, Kota Kinabalu) and duly ordered our bowl of dry sheng rou mian with just plain pork slices – we didn’t fancy tackling any other pig parts that it’s often served with. The broth is made out of pork fat and more pork fat – making it just one salty, porky experience. I’m quite the greedy pig myself so I quite enjoyed this, if I didn’t think too hard about my hardening arteries, and I’d recommend it for lovers of tonkotsu ramen. 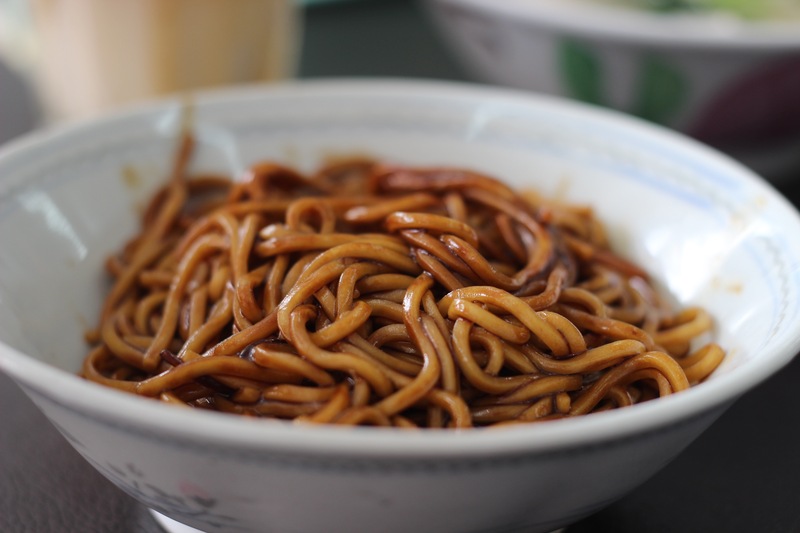 The noodles, however, in their thick soy sauce were neither particularly sweet or savoury and didn’t seem to hold up on their own or go with the soup. Genuinely a bizarre food experience. Just how much fat from how many pigs is in that? Yes, this really is a white bread sandwich but don’t dismiss it. The classic filling is butter and kaya (coconut mixed with egg) and it’s not only childhood level of comfort food, but it makes a perfect on-the-go food or for a beach picnic. 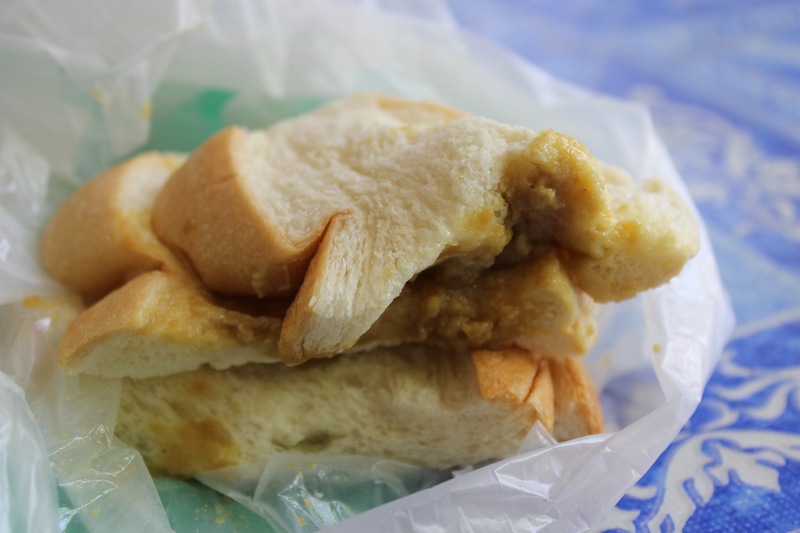 We got take-out sandwiches at Fong Ip Cafe (Gaya Street), where you can get all kinds of fillings – we tucked into butter and sugar, and peanut butter and kaya. Kaya is excellent – any coconut fans need to try this. 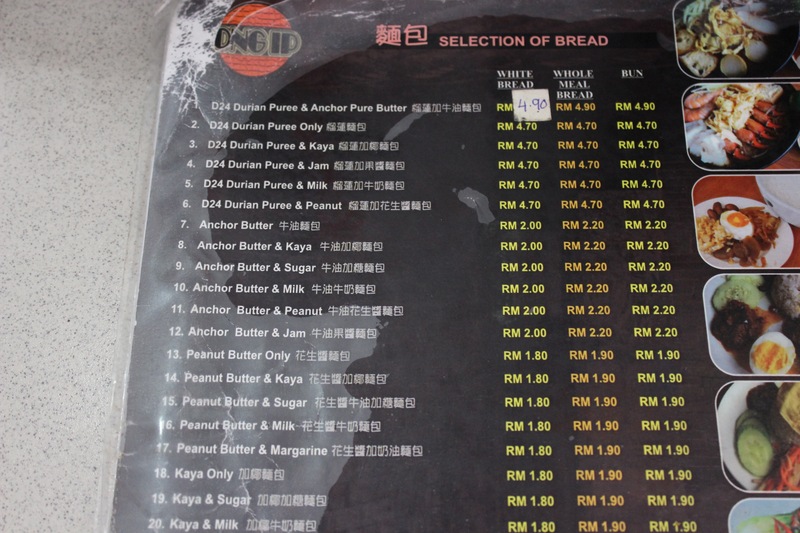 Who’s brave enough to order durian? 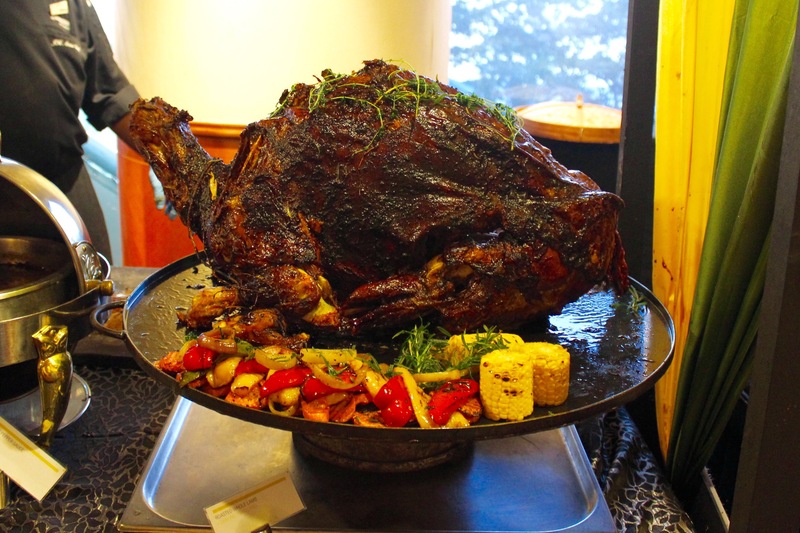 Whole roast lamb – this was one of the highlights, so succulent! This isn’t a particular cuisine… because you can try every cuisine at the feast! There are over 300 dishes after all! If you go to KK during Ramadan, you absolutely must dine at Le Meridien, a centrally-located five-star hotel. Actually, I would recommend dining there outside of Ramadan too because their menu includes ‘tampatan’ (local) cuisine from the indigenous groups of Borneo. These are dishes such as sago with hot & sour fish, fern shoot in hot paste, chicken cooked with mangifera fruit, and hinava (a raw fish salad like ceviche), although the availability and menu will change outside of the Ramadan feast. 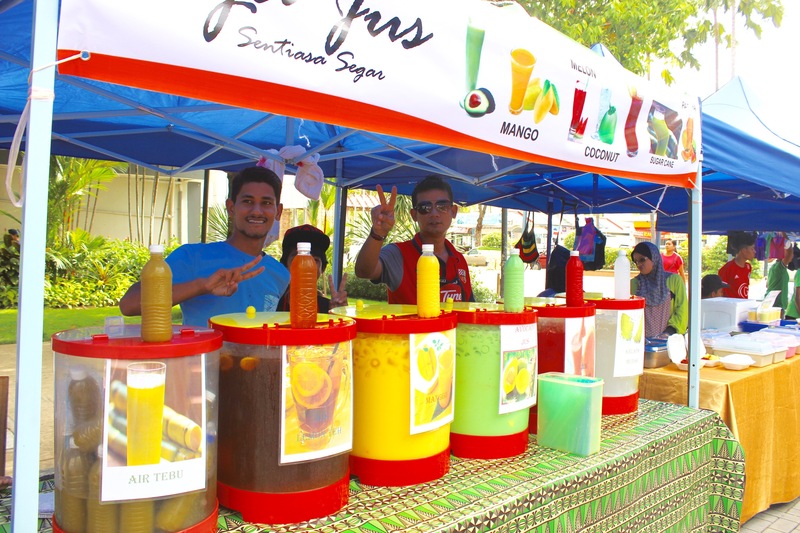 At the feast itself, there are different stalls around a large room, ranging from the above-mentioned tampatan cuisine to Western food stalls, Indian, Chinese, Indonesian, Japanese, a noodles stall and goreng (fried) things station. Let’s not even mention dessert. The feast is incredibly reasonably priced considering – it’s 109RM for early birds, 145RM for walk-ins, and half price for guests of the hotel if you dine after 8pm (Ramadan 2015). Things tend to wind down after 8pm though, so we’re glad we went earlier. I needed a lot of time to eat everything and catalogue it obsessively – I managed 54 dishes in 2.5 hours. Then I spent the rest of the evening comatose. A separate review will be coming soon! We enjoyed some caramelised ribs (who can resist sweet, tender pork meat?) and also wat tan hor (滑蛋河). 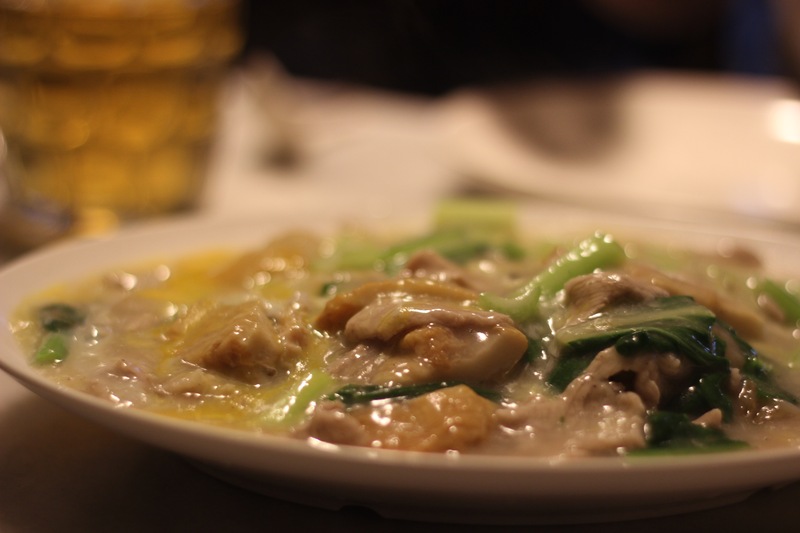 Also known as kong foo chow, it is a dish made with wide, chewy rice noodles in a thick, starchy egg sauce with pork and veg. Some variations also include seafood. 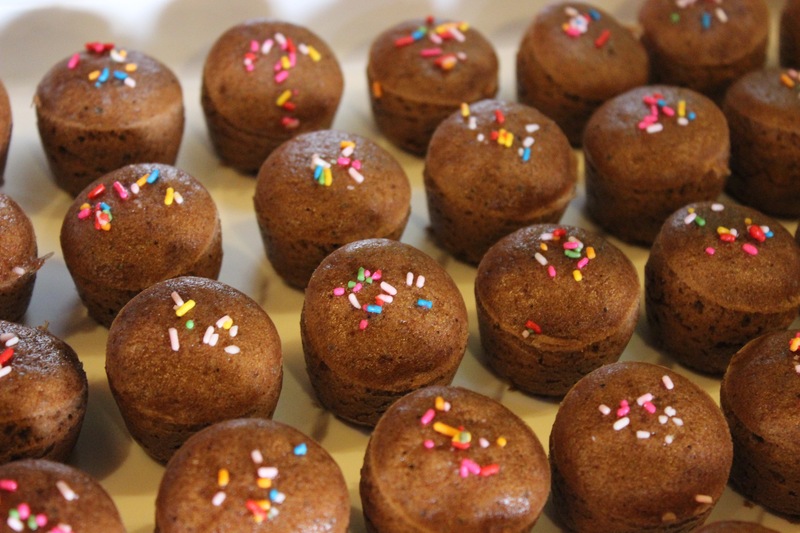 It’s popular across Singapore and Malaysia, and worth a try! One word of caution – try to eat at local places as much as possible. We stopped by Kohinoor, an Indian restaurant along the waterfront, where we had the most spectacularly bland and overpriced food. Lonely Planet employs a clichéd description of its naan as ‘pillowy garlic naan.’ I’ve never had such a thin, chewy, meagre and UNSOFT naan in my life. Shocking. This guy is committed. A lowdown of the best foods and where to find them. Absolute respect. Some of these you might have to travel away from the centre for, but if you’re foodie enough, you’ll do it! If you want places all within a 15-minute walk of the centre, this is your list! 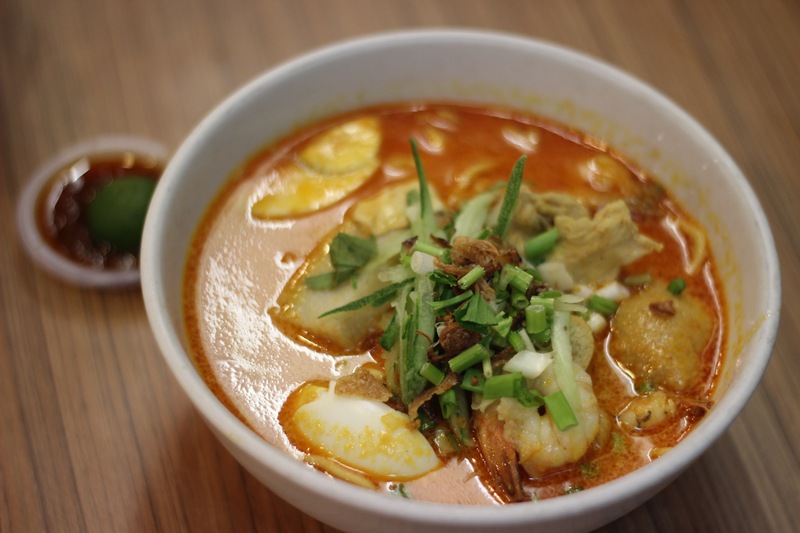 It held the secret of the Palm Café Laksa Melaka for which I am eternally grateful. Think twice about the recommended custard buns at Emperor Delight, unless you really, really like eggs disguised as custard. It is not custard as we know it in the UK! Sadly, I actually discovered this site after my time and have since been enjoying their Instagram account, but the site is connected with the Fork & Spoon foodie newspaper that you can pick up for free around Kota Kinabalu. Really interesting stuff. So, admittedly, Kota Kinabalu is short on big attractions and reading guidebooks, it feels like the writers were scraping the barrel for ideas. 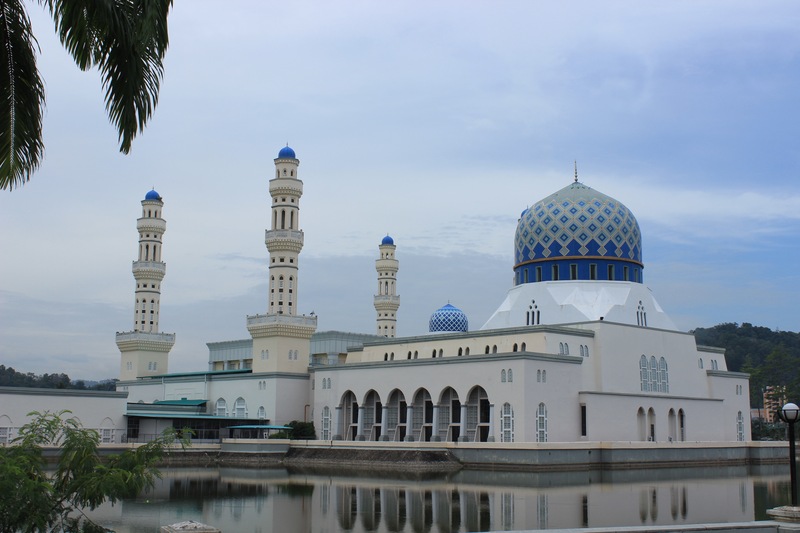 For example, we visited the City Mosque, which is beautiful from the outside, set above water so it looks as if it were floating. However, the inside is really stark and probably one of the least attractive I’ve ever seen. Equally, the close-by Puh Toh Tze Buddhist Temple is pretty enough, but fairly unremarkable as Buddhist temples go. Here are some of the things that we enjoyed to help you decide what might interest you! We arrived a little late on the Sunday to appreciate this in all its glory but it was still a bit of squeeze to move down the length of Gaya Street, packed with clothing and souvenir stalls, where I picked up some baggy hippy trousers to fit into the scene. Remember to bargain – prices can be cut in half with the right strategy. There are also pets sold at the market but approaches to animal welfare might be a little different from what you’re used to. With a title like that, we knew we couldn’t resist a visit. The society believes in taking the best values from Buddhism, Christianity, Islam and Taoism to created a thoroughly morally uplifted society. The site consists of a large hall, in which there are detailed explanations of Longevitology, an organisation founded in Taiwan in 1993 by Dr. Tom Lin, which is all about improving the body’s ability to heal itself through managing energy flow. 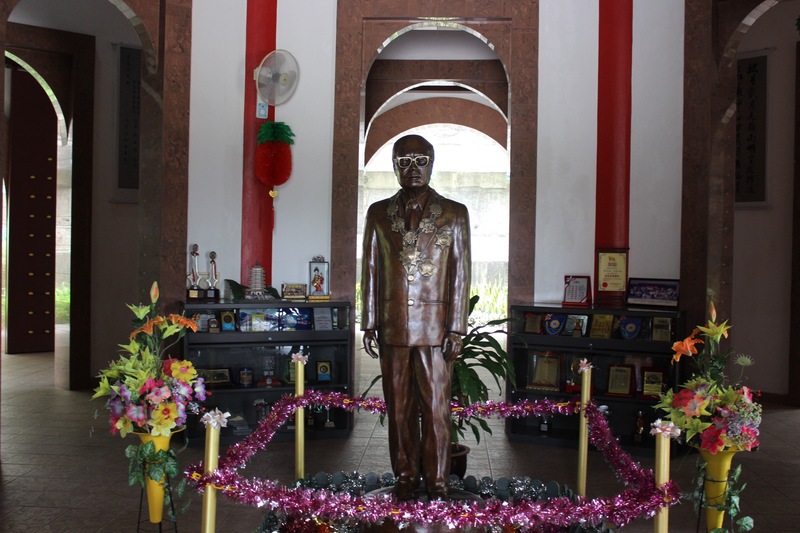 There are many rules in Longevitology adjustment centres, including upholding the Malaysian government’s motto of ‘Love our nation’, and the banning of massages, reflexology and other therapeutic practices, as well as religious or political practices within the centre. 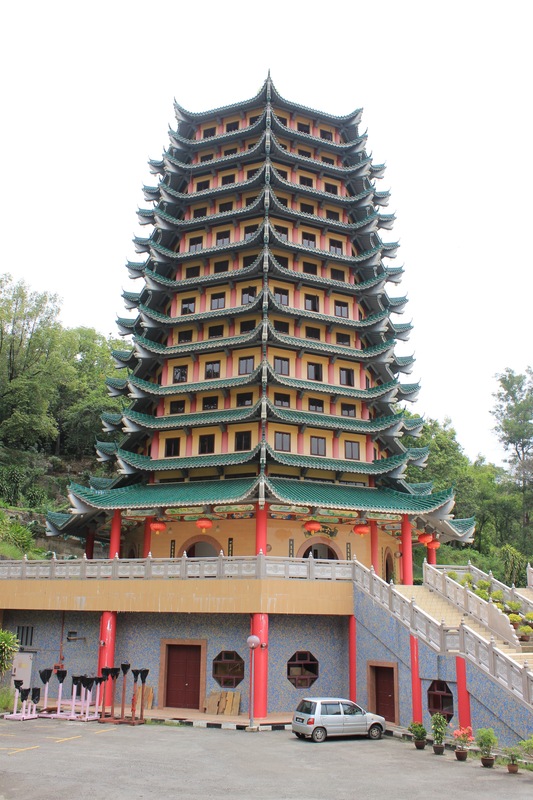 Next to the hall is a splendid 12-tier pagoda. Subsequently, we read that you’re not actually allowed inside but we had no idea and climbed all the way to the top for a fantastic view. Oops. We also discovered this dude in sunglasses surrounded by tinsel. This made our day. Just 20 minutes of strolling around here might be enough, but anyone who wants to know a bit about how people live should look at the locals shops and food. 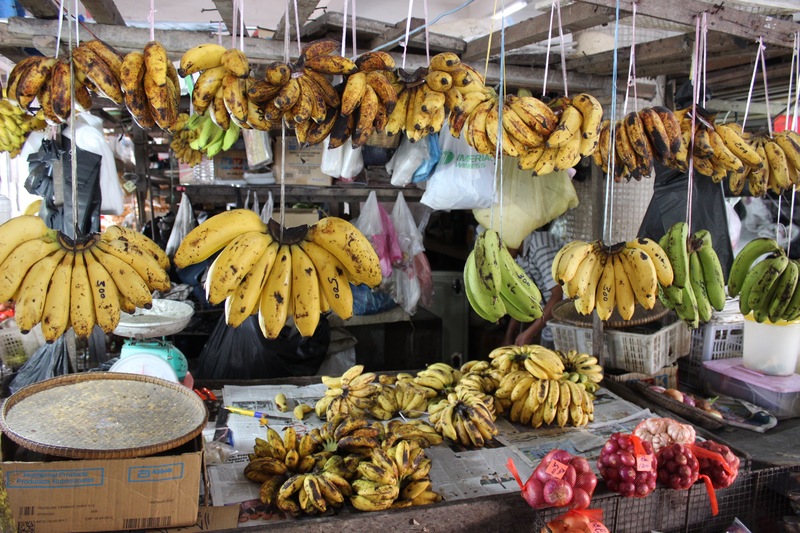 Chillies, dried fish, ginger, meat, biscuits in jars – this market has it all. 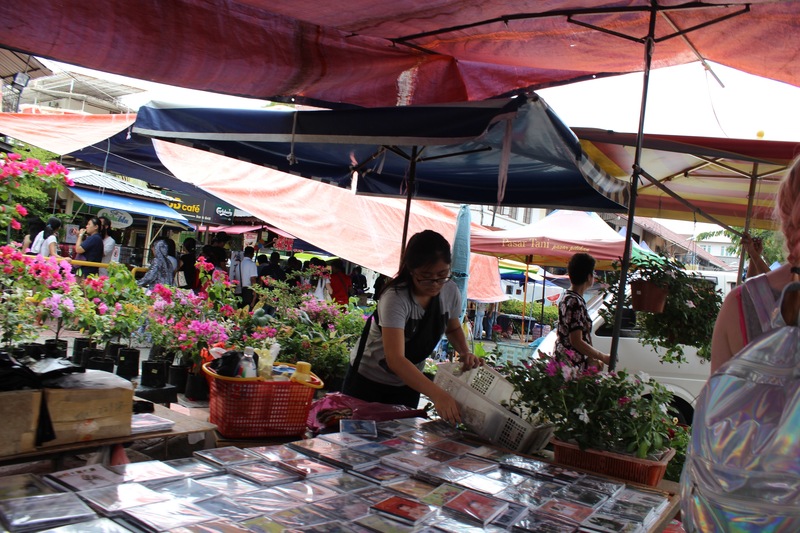 By contrast, the ‘handicraft market’ is underwhelming, full only of standard tourist souvenirs often with ‘Sabah’ or ‘Kota Kinabalu’ printed on them. I’m a sucker for a view, particularly one which I have to work for. To the east of the city and about ten minutes walk along a jungly path, you’ll reach the top of Signal Hill where you can look at Kota Kinabalu wedged between the high land you’re standing on and the coast. Shuet Li, drawing me some beautiful henna! Some of the best experiences I’ve had whilst travelling is when I’ve been taken out by local people. 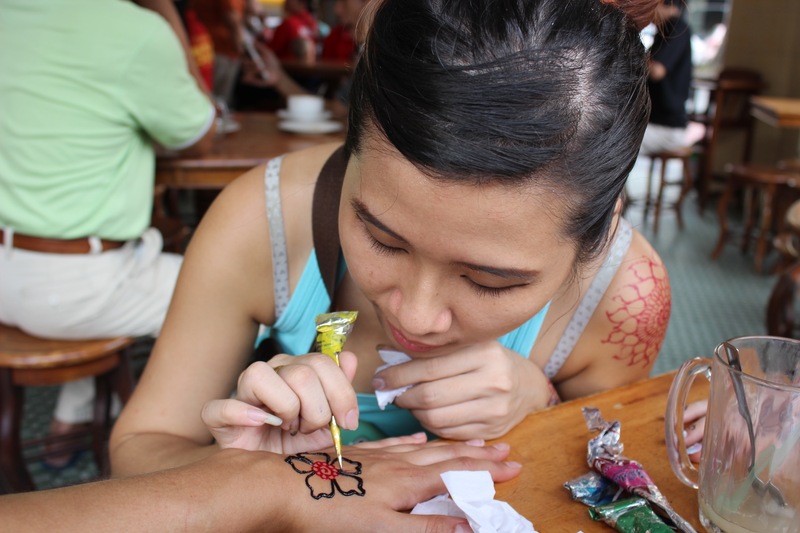 On our very first day, we got some coloured henna done by the very talented Shuet Li and she later invited us out with some friends. We got to enjoy bubble tea and magic tricks for the evening, experiencing a Friday night in the suburbs! 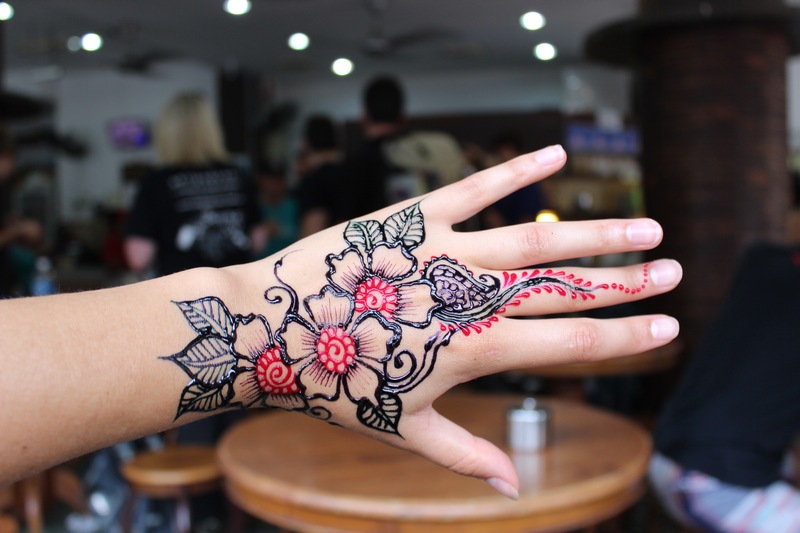 If you want to get some very beautiful and reasonably priced henna, visit Shuet Li’s shop in the back of Chap Teo Seng, a small supermarket, on Gaya Street, opposite Party Play and next to BB Cafe. 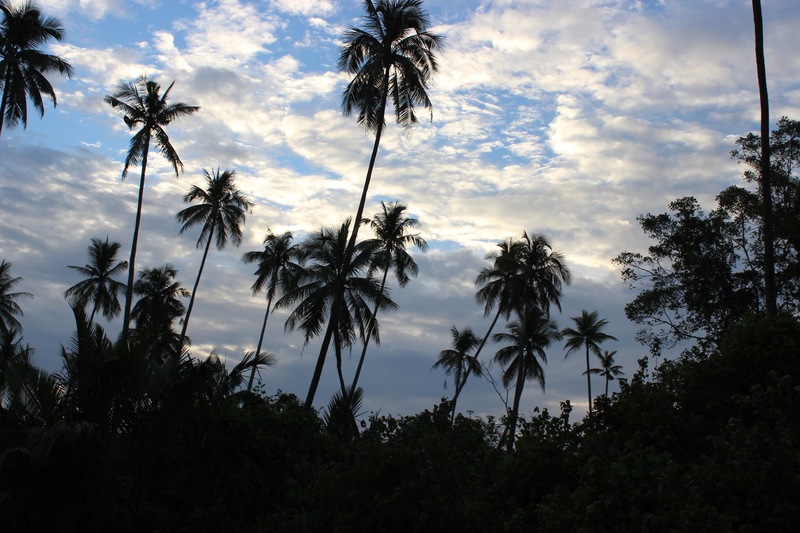 So if Kota Kinabalu makes a great base for day trips and tours, what adventures can you set off on? We initially wanted to go to Kinabalu National Park, but there’s nothing like a big earthquake to ensure that nothing is open. However, here are three trips we really enjoyed and there are plenty more options available, including jungle trekking and white water rafting. My scepticism was on high alert. Reconstructed indigenous people’s houses and a guided tour around them? Sounds like a massive tourist gimmick to me! Yet, whilst of course it’s purely for tourists, the educational and entertainment value was excellent. 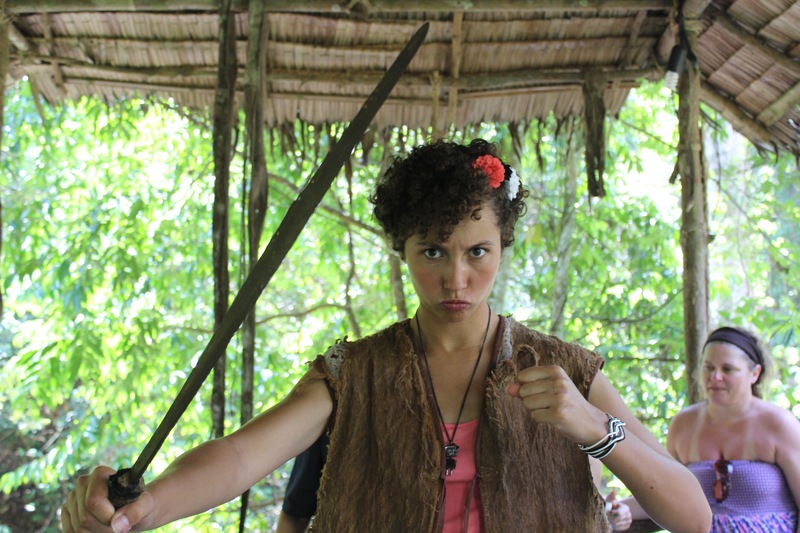 They gave me a sword and made me the tribe leader – how could I NOT be happy? 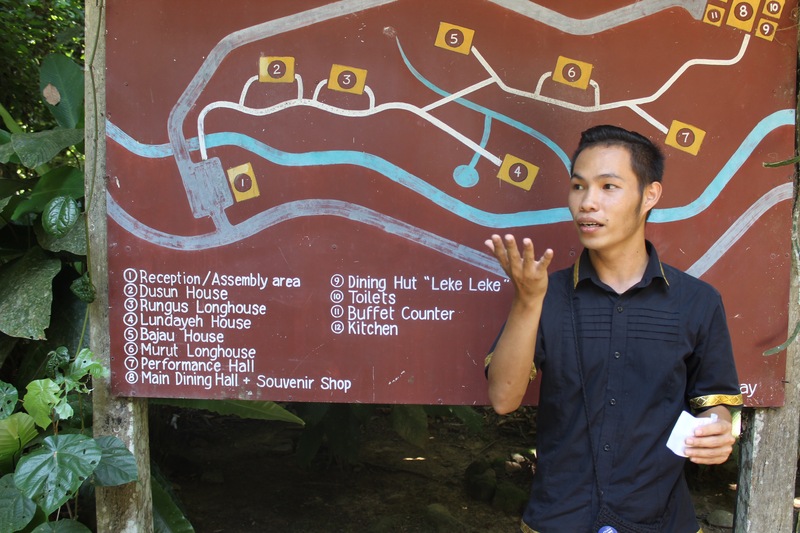 Although you can visit Mari Mari Cultural Village independently, most people go as a half day tour, costing around 169RM. We arrived at about 10am in the morning and were then guided through the cultures and living areas of five different tribes. Not only was our guide enthusiastic and knowledgable, able to answer questions competently, but everything was genuinely so interesting. As you go around you get to sample rice wine (quite similar to sake), traditional biscuits, bamboo-steamed chicken and potato, and honey, as well as try out a blowpipe and an indoor trampoline! At the end, there is also a dance performance. Afterwards, a buffet lunch is laid on but it’s not of spectacular quality, save for the fried bananas, which you should definitely load up onto your plate. You’ll hear many things about these islands, reachable by a short ferry ride from Jettison Point. Many people decry them as being too heavily populated. 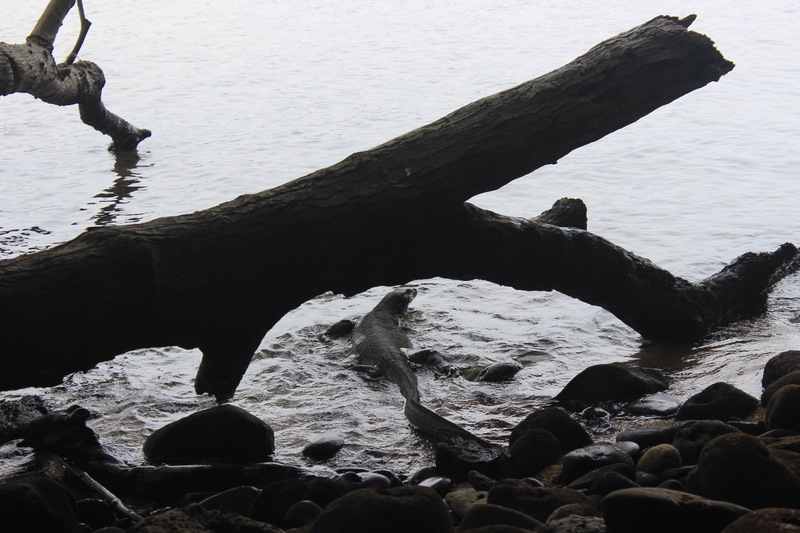 Others swear that X island is more interesting or cleaner than Y island. At the jetty, you can buy a ticket for one, two or three, so you can freely compare them for yourself should you wish! 1) It has Water Monitors – the second largest lizard after Komodo Dragons! 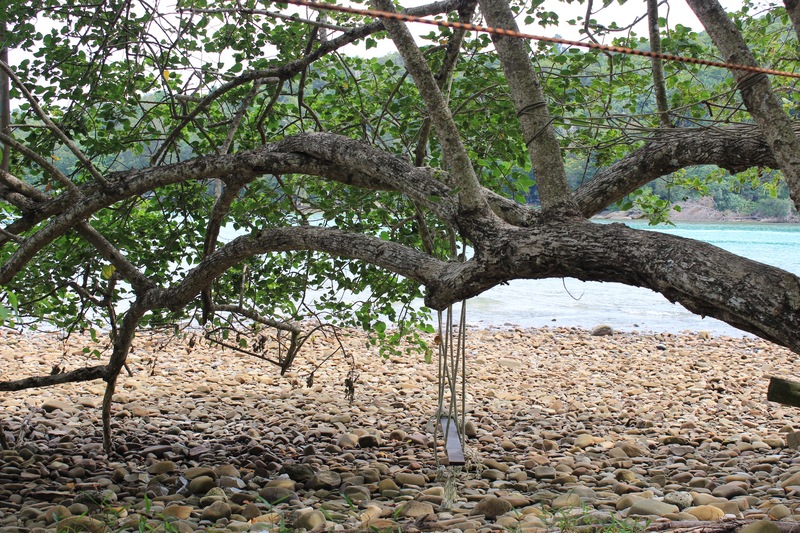 2) It is the start point for the Coral Flyer, a new island-to-island zipwire. 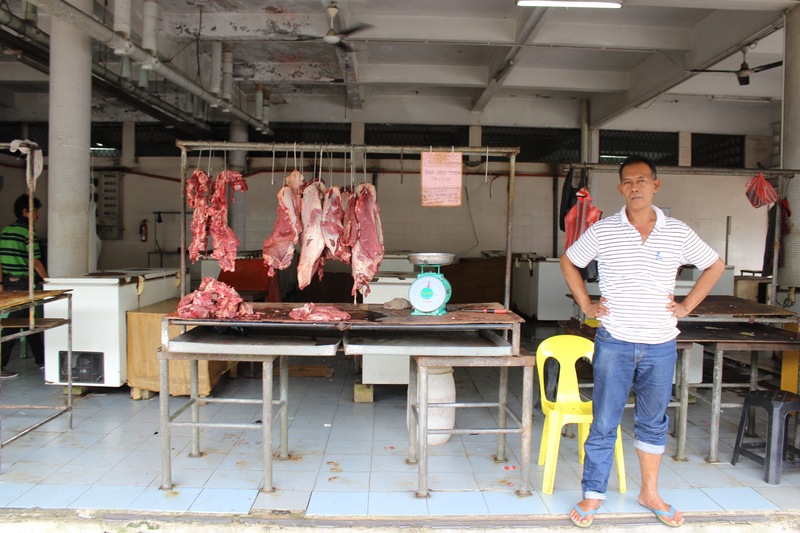 We found Sapi to be busy but surprisingly clean and orderly given the numbers. There are toilets, showers, a very simple cafe, a giant outdoor buffet, and lockers for your belongings for 10RM, which prevent you worrying about your phone/wallet when in the water. On arriving, we immediately rented a mask and snorkel set and beach mat. I advise you to do this on the island rather than before you set off, because should anything be defective, you can take it back and switch it. Be sure to check the times that the beach is open as one of the main areas will close at low tide to protect the coral. We missed this area but ventured to the second beach the other side of the pier and found some really interesting coral and fish. For your information, do not find Nemo as he is rather aggressive. 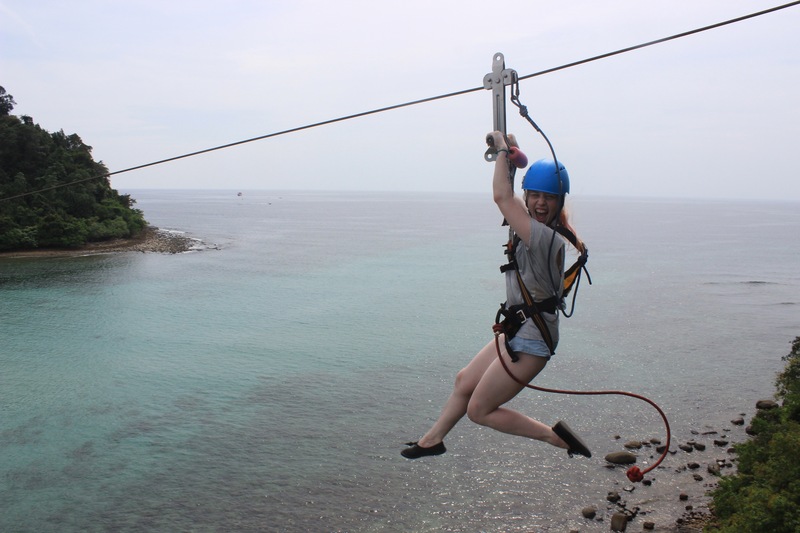 We then went to do the Coral Flyer, a ~250 long zipwire between Gaya Island and Sapi Island. For 65RM, you take a boat over to Gaya island to receive your harness, make your way up a short and steep incline and then get strapped up and buckled onto the wire. There are two wires so you can zip across the water simultaneously with a friend. If you’re an adrenaline junkie, you might find this a little tame – the top speed is around 60km/hour, but it didn’t feel that fast to my friend and me. Mind you, I’ve jumped the highest bungee in Latin America and she’s thrown herself out of a plane so we’re probably not typical judges of adrenaline – for us, it was fun but not thrilling. I also got stuck at the end away from the platform – I think the guy didn’t manage to catch me in time and I swung back – but I was so busy taking photographs that I didn’t notice until I saw he was coming to reel me in! On the walk back from the landing site, we saw a really giant water monitor lizard so it’s worth wandering a little way from the crowds. It’s advisable to the islands in the morning as boats only leave once they get full. Boats back from Sapi leave at 2pm, 3pm and 4pm, and things really quietened down after 3pm. 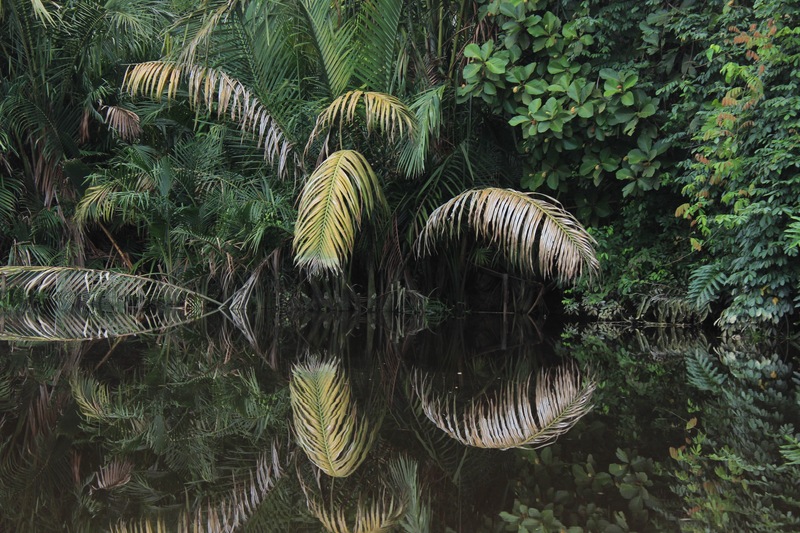 Whilst in Sabah, I really recommend spending two-three days in a jungle lodge, river cruising and jungle-trekking, to witness the incredible diversity of nature in this region. However, if you don’t get the opportunity – or if you didn’t spot any probiscus monkeys or fireflies, then this half-day trip is really recommended. Prices vary with each tour company but we paid 165RM, leaving Kota Kinabalu at 2pm and returning at 9pm. It’s quite a long drive (~2 hours) to the river, but on arrival you’re given tea and local sweets to energise you. Then you pile into a boat to spy some proboscis monkeys! If you haven’t seen a proboscis monkey before, these incredibly odd look creatures have been made the symbol of Malaysia. The male has a giant long red saggy nose, which attracts females. He also looks like he’s wearing white underpants! Alpha males fight for dominance with the winner establishing a hareem. The other males all live together in a ‘bachelor group’ and where they probably make lad jokes and bemoan their sexless lives. My camera wasn’t up to photographing the wildlife but I got the beautiful sky! Although the boat trip is only one hour, you will get to spy a lot of these monkeys, particularly towards dusk as they come to settle by the river for safety during the night. We also spied a crocodile and a beautiful kingfisher. Back at the jetty, a buffet dinner was provided, with some surprisingly tasty soy beef and chicken curry. After that, it’s another half an hour in the boat to spot night creatures, Again we glimpsed a crocodile and we also got really close with a beautiful buffy ear owl. And, of course, there were hundreds of firefliess. They fly all around the boat and some may even land on you – if you cup your hand carefully around one, you might be able to glimpse its body. It truly felt magical to be surrounded by so many tiny lights. The ‘pod’ was a little tight for space…. JOKE. This is the suitcase storage locker. We spent a couple of nights in PODs The Backpackers Home (Point Shopping Complex, 1, Jalan Centre Point, 88000 Kota Kinabalu), which is located very centrally, right opposite Centre Point Shopping Mall. It’s tiny but very clean and we were lucky to have a private room with apparently the only window in the place! The aircon is pumped into the room and controlled centrally so the first night it was so icy we had to sleep fully dressed! After explaining this, however, we were gien a stack of extra blankets and we think they turned it down a bit for the second night. 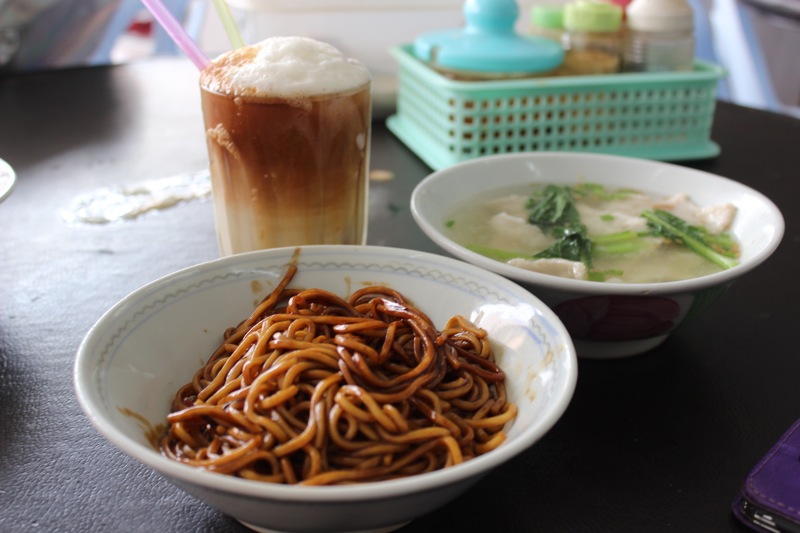 Breakfast is provided in the form of bread, peanut butter and jelly, but we were more eager to eat noodles and laksa down the road! Staff were very helpful, allowing us to borrow the phone and print our boarding pass, and there’s also a folder of tours that they can help you arrange. We spent a couple of night’s in SKYPOD Hostel, but it’s a little way out of the centre to the north of the city. Here we stayed in a dorm room, with the beds contained in pods, with their own lights, plug socket and curtains for privacy. Very new. the place was impeccably clean and the staff again very helpful, especially their duty managed Erick, who will happily provide detailed advice about what to see and do. He also kindly looked after my mobile phone after I abandoned it in his car on the way to the airport (30RM for airport taxi service). There is also a shuttle service into and from town once a day, and airport pickup is 30RM. There’s also a cereal and waffle breakfast! Do not try to get the bus there – the directions we were sent were misleading (probably due to a lost in translation problem), and a kind man whom I’d asked for directions ended up driving us all the way to save us a 45 minute walk! One of the staff also bizarrely went into our pod before we’d checked out or taken our stuff and threw my friend’s toothbrush away as part of the ‘cleaning process’. 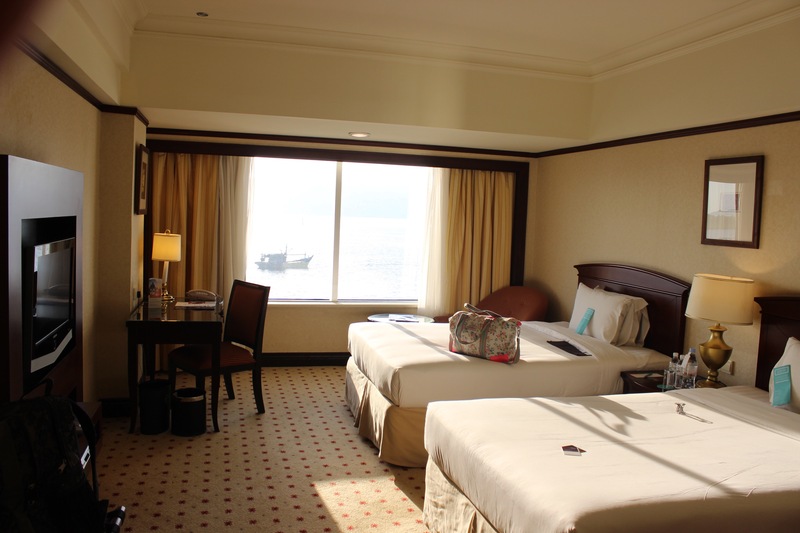 We fancied a bit of pampering on our last day so we checked in the five-star Le Meridien Kota Kinabalu (Jalan Tun Fuad Stephens, 88000 Kota Kinabalu). 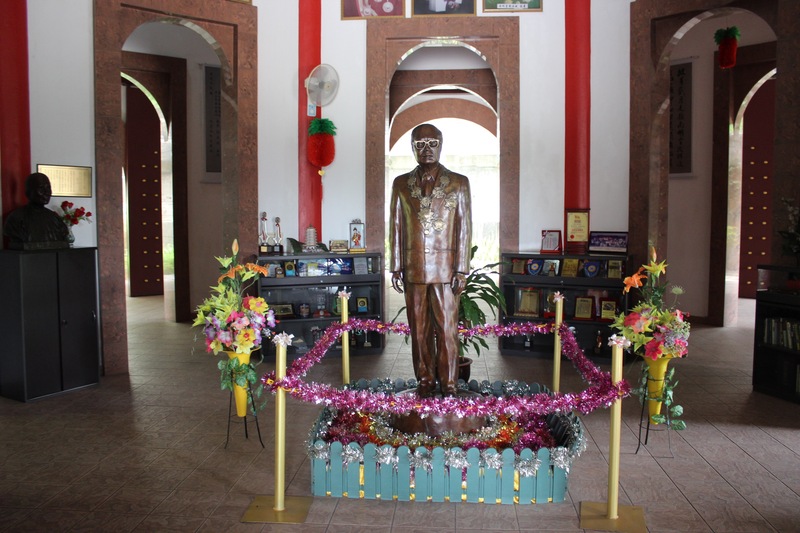 During our visit (June 2015), the lobby was in the process of being renovated but the reception was spotless and the warmth of the staff was fantastic. They couldn’t have been more efficient or helpful. Our room was really spacious with a fantastic view over the sea. It did look a little scuffed and faded in places so I’m hoping they’ll keep up the renovation throughout this year. 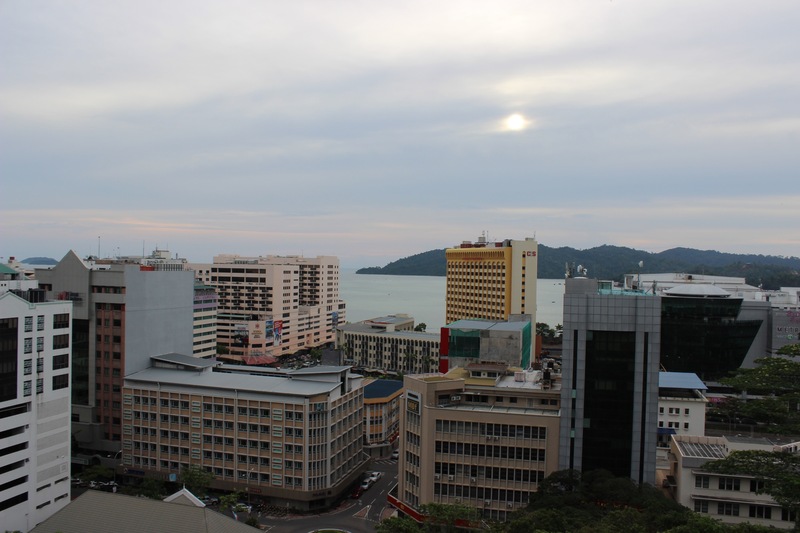 Kota Kinabalu is accessible from Kota Kinabalu Airport about 6km south of the city centre. It has direct flights to Malaysia – you’ll likely change at Kuala Lumpur – as well as international flights to Indonesia, Hong Kong, China and Japan. A taxi to the city should cost around 25 to 30RM or there is a fairly regular bus that costs 5RM. The city centre itself is mainly walkable but taxis can be obtained cheaply for further out locations. There is also a public bus system, but make sure you have very clear instructions about where to get off! Thank you! I love your website 🙂 Can’t wait to go back to Sabah! Great post. I’ll be in KK next week!